If you haven’t seen the movie WONDER, you should. It tells the inspiring and heartwarming story of August Pullman, a boy with facial differences who enters fifth grade, attending a mainstream middle school for the first time. As a father of a son with special needs, I related to the movie on many levels, but particularly the way in which August’s differences affect his social integration into the school system. My son Levi is 7 years old and has apraxia of speech, an acquired oral motor speech disorder affecting his ability to translate conscious speech plans into motor plans, which has resulted in his inability to speak. For now, he uses an alternative communication device (aka his ‘talker’) to express himself. Having a child with special needs like Levi, I think one of the main concerns for my wife, Michelle, and I has been how he will fit in socially in the world. What would it look like for him to have good friends? How do we help him begin to develop friendships? In darker moments wondering, will he be damaged as a person because his speech isn't typical, by people ignoring him, by not being able to express emotions in a healthy manner? Just real questions that sort of linger...but that are finding some relief thanks to the gift of the community which we feel so blessed to be a part of. The marked difference in the narrative of WONDER and my own narrative is the gift my family has in being surrounded by a community of people and a K-12 Academy that are teaching children at a young age to befriend, accommodate and include children with special needs. Levi presents about his new pet guinea pig during share time at the Academy for G.O.D. Levi's kindergarten teacher asked students where their favorite place was to go and Levi used his talker to say ‘airport.’ From across the room, Liam Bennecker shouted, “The airport is my favorite place too Levi!” It may seem small, but Levi’s participation and connection with another student are the small steps that we are so glad to see taking place. Sometimes Levi struggles to keep up in line when the class is going different places. A few students have naturally started holding his hand to help him stay focused and better balanced. This has been fun to watch. A few girls were on the playground playing ‘Choo choo’ where they line up and put their hands on each other’s shoulders and move around. Levi found a train on his talker and communicated that he wanted to play and they were so welcoming to him joining in. One day, Levi needed help opening something. And he was just grunting to ask for help. Two girls in his class leaned over and used the sign for ‘open’ to tell Levi to use his signs. It showed that they have paid attention to his signs and have showed the care to want to connect with him. Again, it’s these small moments and so many more that we are grateful for. Academy students after their Buddy Break training. But the same kindness is felt all throughout the Academy, not just in Levi's class. For the past six months, high school students have been volunteering with a program called Buddy Break. Buddy Break is a non-profit organization that provides a once-a-month children’s program for families with special needs. The program allows parents to go out and relax for three hours in the evening while their children are cared for. 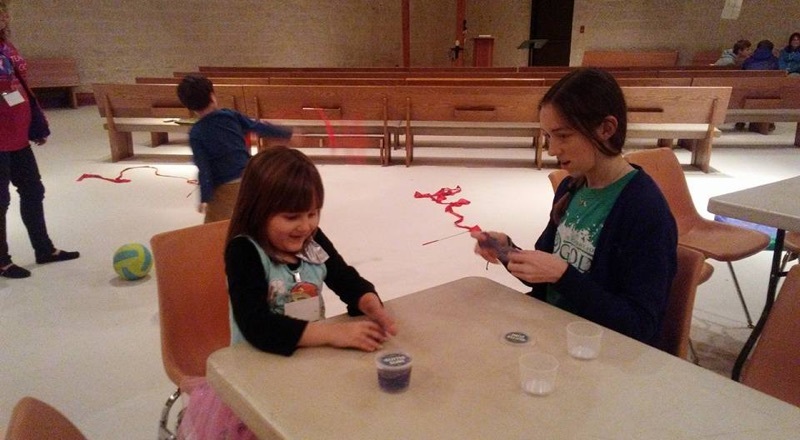 Every child in the family, special needs or not, is assigned to a volunteer at a 1:1 ratio and they spend the evening playing games and doing activities. While limitations for sociability do often exist for individuals with special needs, those limitations often get exaggerated because people don’t quite know how to make the step into accommodating and befriending kids like August or Levi. Programs like Buddy Break allow volunteers take this next step, long before adulthood when they might fulfill roles like teacher, counselor or principal. Merci Warren, Academy for G.O.D. freshman, helps with an arts and crafts activity during Buddy Break. She says, "I've loved serving kids and giving them a great time!" As Levi’s Dad, I couldn’t feel more thankful and blessed to be part of such a wonderful thing taking place at the Academy. More than being on par with their peers academically or the latest in therapy technology, kids need friends and good, caring people around them to love them. In that regard, as hard as some days are, I feel like we hit a gold mine.